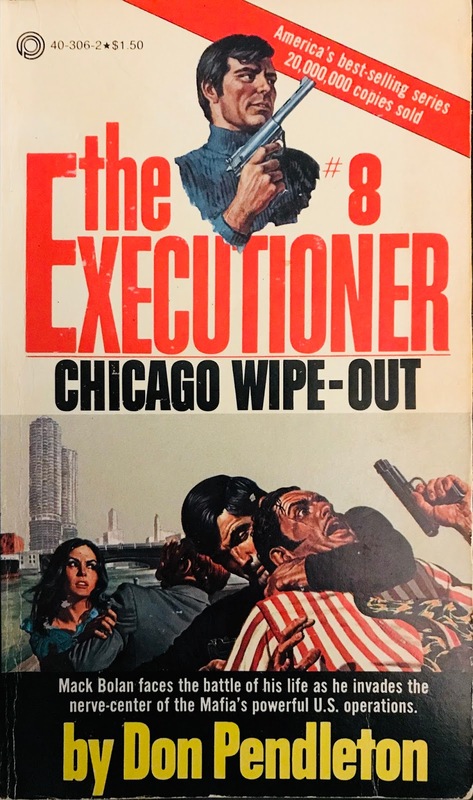 Fresh off destroying New York's Gambella family, Mack heads to the mid-west for 'The Executioner #08: Chicago Wipe-Out”. Pendleton could have titled this “Chicago Whiteout” with all of the action blanketed in a heavy snowstorm that's paralyzing the city. With the usual blend of mobsters, cold steel and a beauty on the run, the author creates another stellar entry in what has become the defining series of the vigilante genre. The opening chapter is a violent exercise as Bolan sets up shop near a large house owned and operated by the Mob. As each bolt rams home the Weatherby .460, Pendleton is sure to describe the end result. One by one the bullets penetrate the Mafia's defenses before Bolan is forced to crawl from the house and move to face to face action with a Beretta. This is an intense, exhilarating opening chapter that finds Bolan rescuing the evening's entertainment, a young and beautiful girl named Jimi. The hunt is on for a safe spot to place her, but first there's an obligatory shower scene where Jimi thanks Bolan for the save. 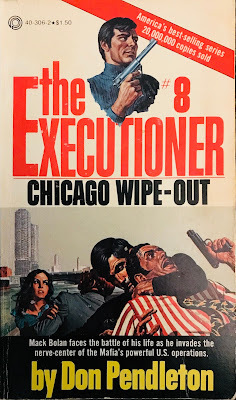 One of the best scenes of the first eight books is here, with Bolan and Jimi surrounded by thick snow and the Mob's gunners outside their motel room. Bolan provides quick instructions for Jimi and the two quietly creep through the darkness to escape. The action is from Jimi's point of view, blinded by darkness and fear while she hears Bolan's suppressed shots in the night. As the bodies fall, the two flee to a nearby attorney named Leopold Stein. Stein has been put out of business by crooked Chicago politicians and Mob heads despite his outpouring of testimony and evidence citing the Mob's influence on the city. Bolan deposits Jimi here as he prepares for the final battle with Chi-Town's evil. While the first half was all-out war, built on an incredible pace and the proverbial “all-guns-blazing”, the second half is a cat-and-mouse effort penned perfectly. Bolan dons a disguise and cleverly walks into the lion's den. Once he sets the Mob and police against each other, it's a race to the finish with Bolan's firepower in the front seat of the Warwagon. This is an effective, well-written finale that finds Bolan finishing his mission while still moving the chess pieces for his own gain. While not as fulfilling as the book's opening half, the finale left nothing on the table in its annihilation principles. This is seriously one of the best books of the genre and is just another testimony to Don Pendleton's staggering talent. This one is a mandatory read.